It’s pretty commonly known that Andrew Wakefield’s 1998 Lancet paper on the link between autism and the MMR vaccine has been the source of considered controversy over vaccinations and autism, even after the majority of the paper authors removed their names and the journal retracted the paper. Wakefield’s unethical conduct, the leaps of logic, and the small sample size itself, all contributed to reasons the paper was ultimately discredited. Click to continue reading, or to comment. Over on the BBC website, reporter Chris Jeavans is blogging about her August challenge: to live a month without buying or accepting anything wrapped in or made with plastic. Why? 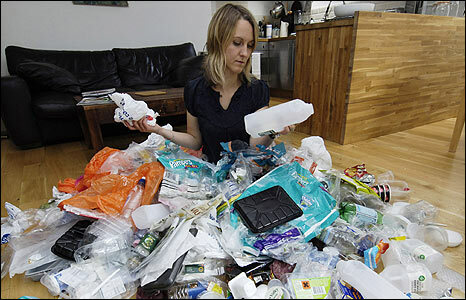 Because even though we’re all repeatedly implored to reduce, reuse and recycle, plastics are still one of the most common things to make it into our trash, our landfills, and our oceans. So she wanted to track exactly how life would change if she gave up plastics – first, of course, tracking how much plastics she and her family used over the course of one month. Until now, it was thought that hearts from those donors were too badly damaged to be transplanted successfully. Only hearts from donors who were brain-dead — and whose hearts were still functioning after they were declared dead — have been considered suitable for transplant. To make the donors’ hearts more viable, doctors at Children’s Hospital in Denver altered the standards for declaring the patients dead… The Denver researchers narrowed to as little as 75 seconds the time between when the donor was pronounced dead and when the heart was harvested. Current guidelines call for waiting up to five minutes as a way of making certain that the heart does not start beating again on its own. But removing the heart earlier increases the odds of a successful transplant since it limits the damage caused by a lack of oxygen to the organ.